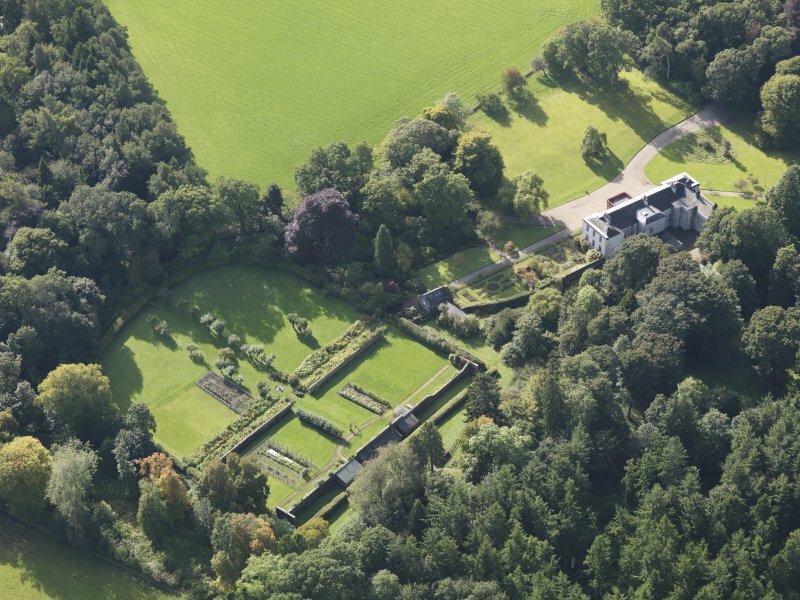 General oblique aerial view of Balnamoon House estate, centred on Balnamoon House, taken from the NW. 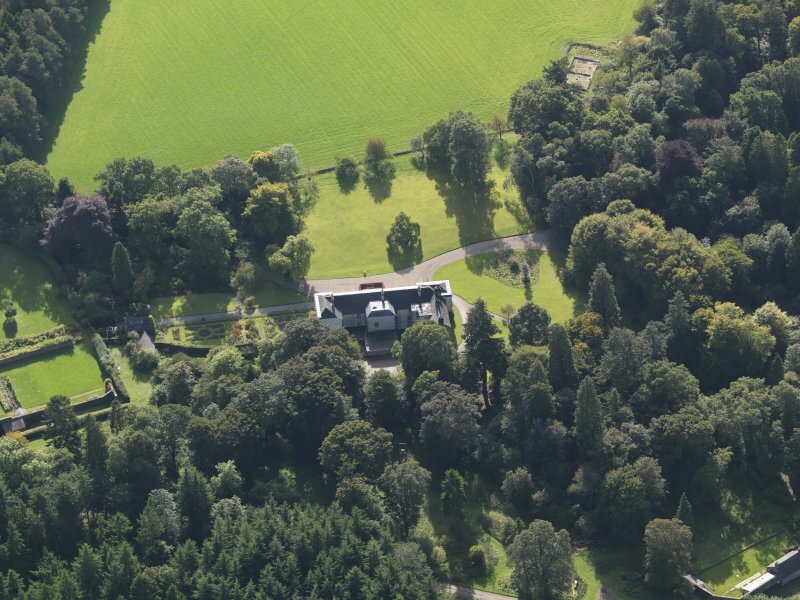 General oblique aerial view of Balnamoon House estate, centred on Balnamoon House, taken from the S.
General oblique aerial view of Balnamoon House estate, centred on Balnamoon House, taken from the SSW. 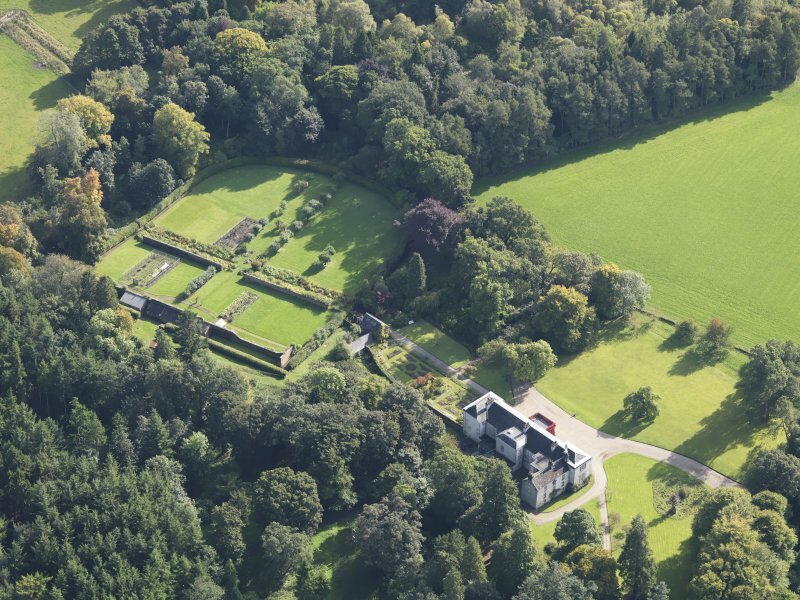 General oblique aerial view of Balnamoon House estate, centred on Balnamoon House, taken from the WSW. 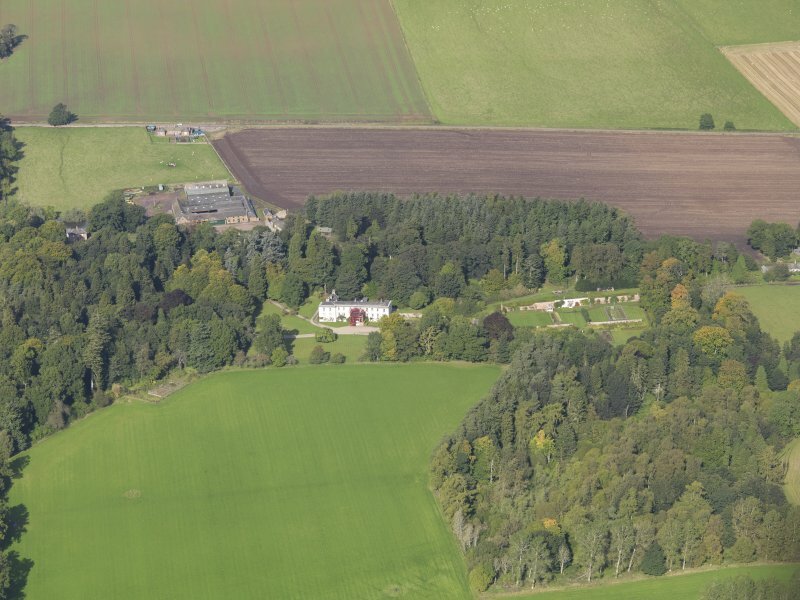 Oblique aerial view of dovecot at Balnamoon House, taken from the SW.
General oblique aerial view of Balnamoon House estate, centred on Balnamoon House, taken from the N.
Oblique aerial view of the dovecot at Balnamoon House, taken from the NW. 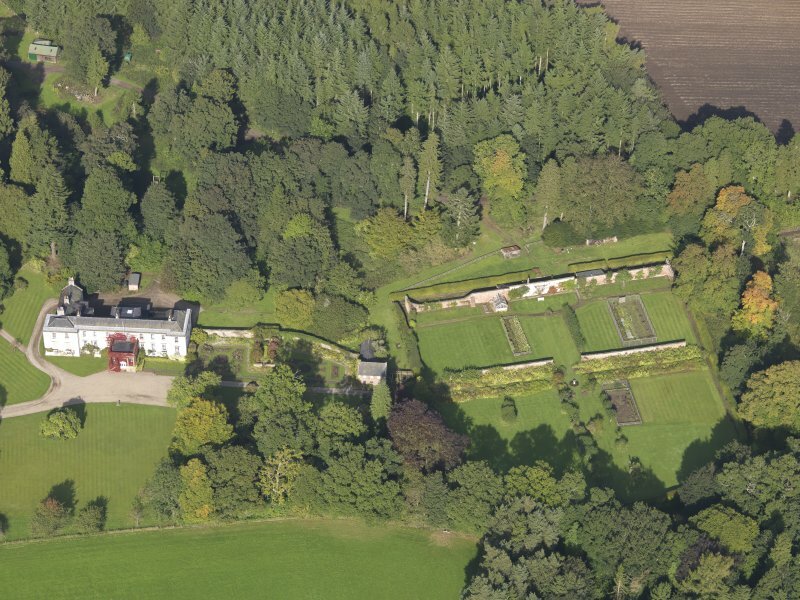 Oblique aerial view from of the dovecot at Balnamoon House, taken from the S.
General oblique aerial view of Balnamoon House estate, centred on Balnamoon House, taken from the SW.
General oblique aerial view of Balnamoon House estate, centred on Balnamoon House, taken from the W.
General oblique aerial view of Balnamoon House estate, centred on Balnamoon House, taken from the NE. 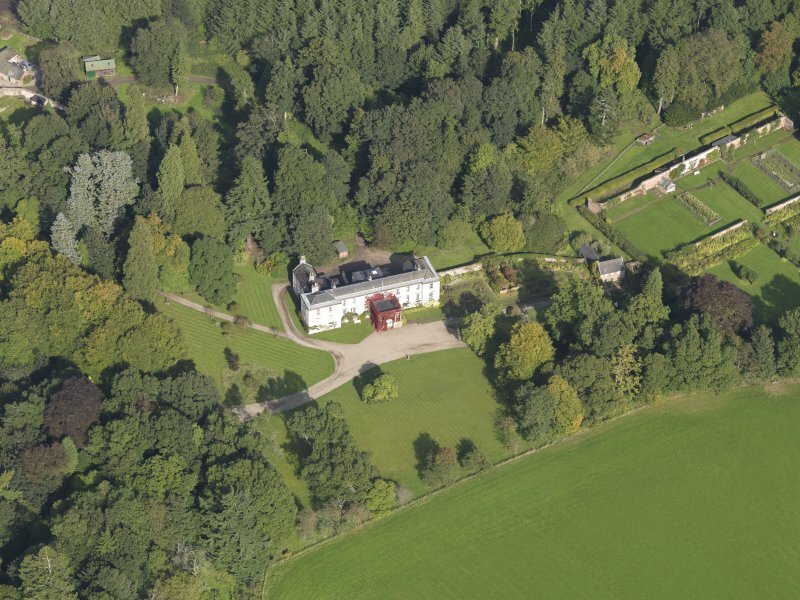 General oblique aerial view of Balnamoon House estate, centred on Balnamoon House, taken from the ENE. 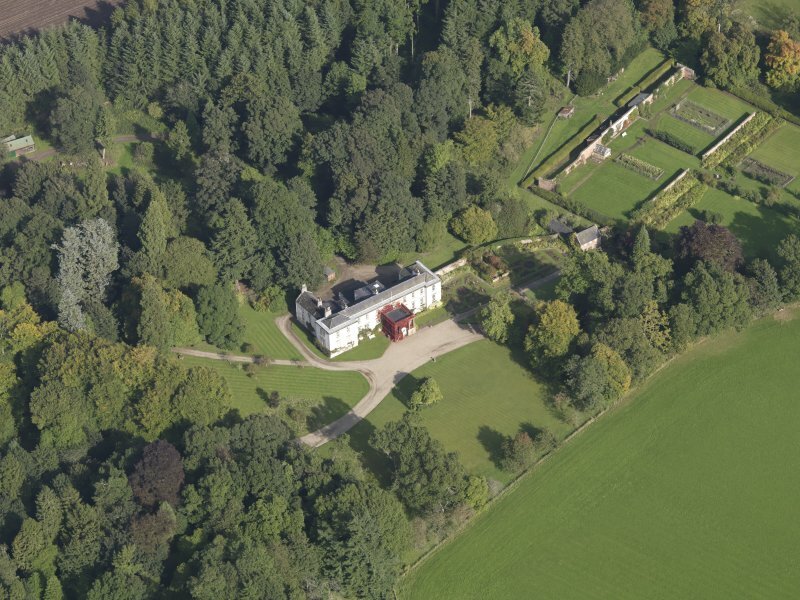 General oblique aerial view of Balnamoon House estate, centred on Balnamoon House, taken from the E.
General oblique aerial view from a distance of Balnamoon House estate, centred on Balnamoon House, taken from the S.
The western part of the mansion house of Balnamoon is old, but the proprietor is unaware of the date of its erection. 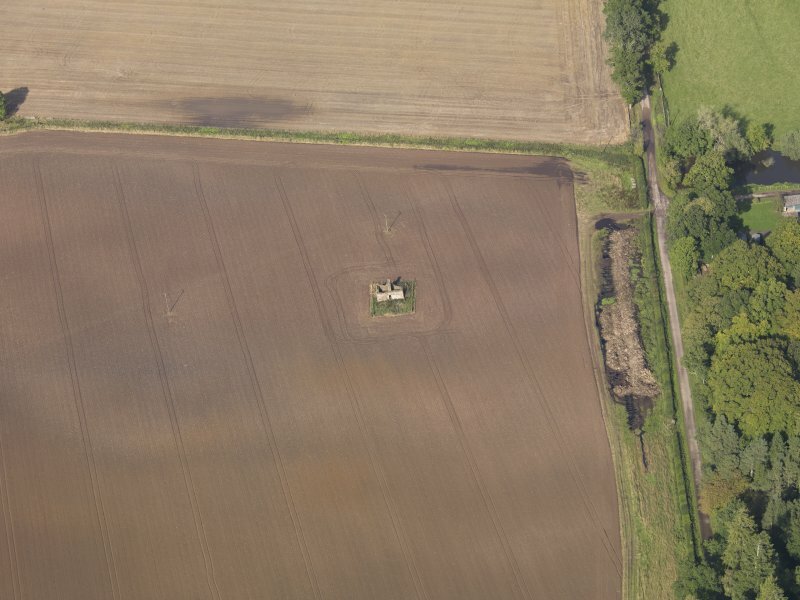 A stone dated 1584 built into the back of the house came from a detached circular tower (with staircase) which formerly stood adjacent to the building. 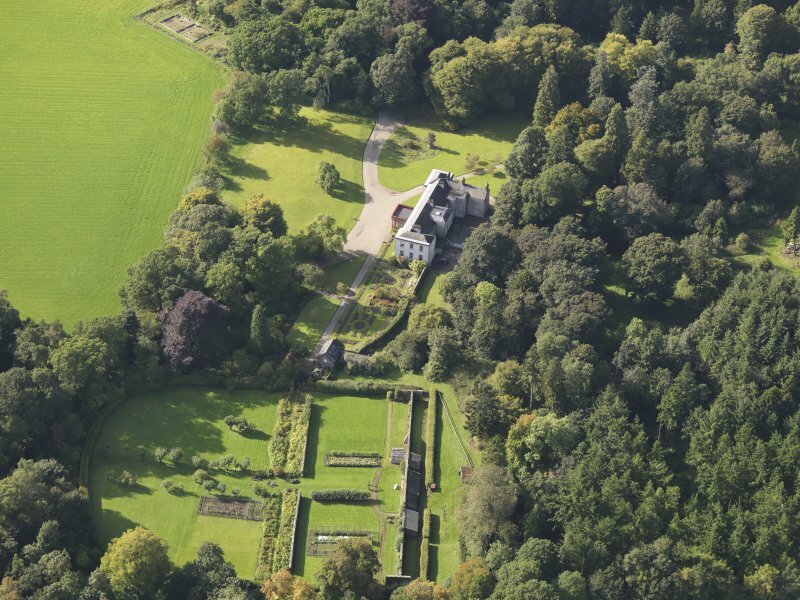 According to Mr Carnegy Arbuthnot, the proprietor 'there are evidences of a moat having surrounded the house'. Name Book 1862; A J Warden 1880-5. 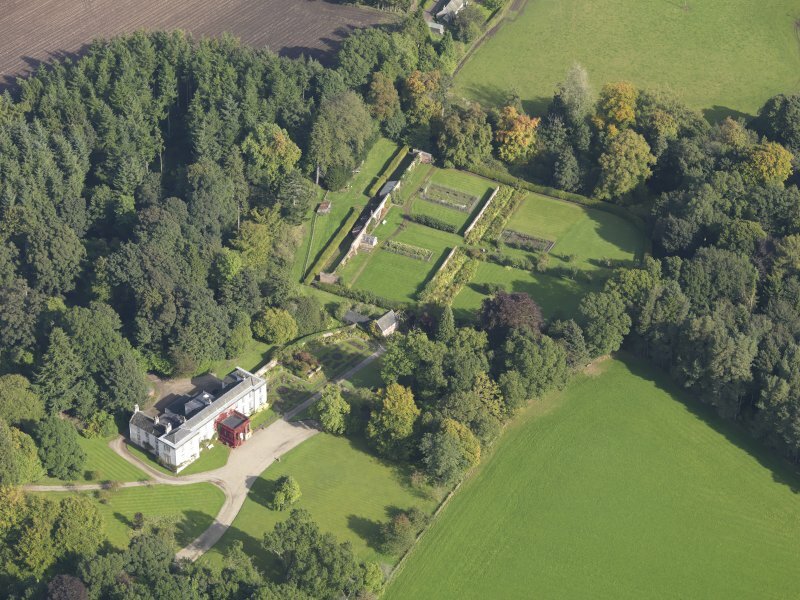 The western wing of Balnamoon is old, and from the plain style of architecture, may be of the late 17th century or 18th century date. Structurally, it is uninteresting. The rest of the mansion is modern. 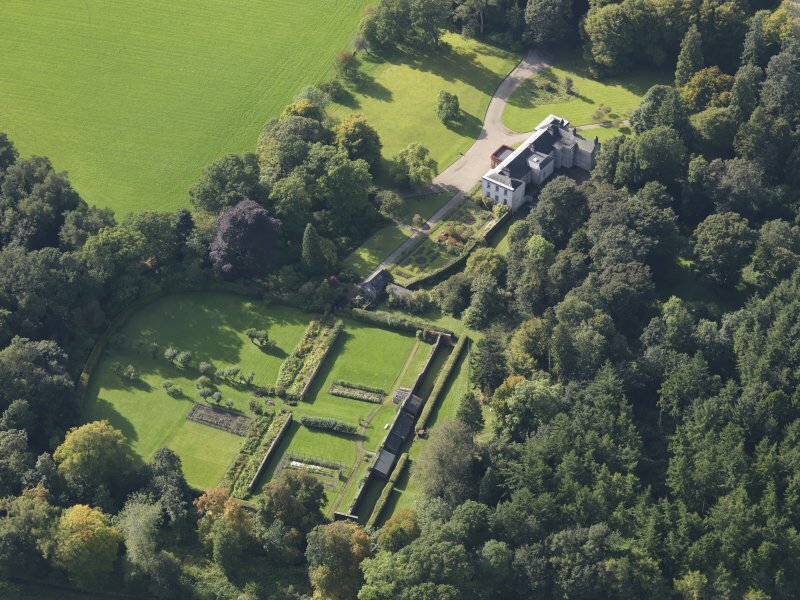 The owner (Mr Carnegy Arbuthnot) believes it to be of 15th century date but there is no supporting evidence to confirm this. 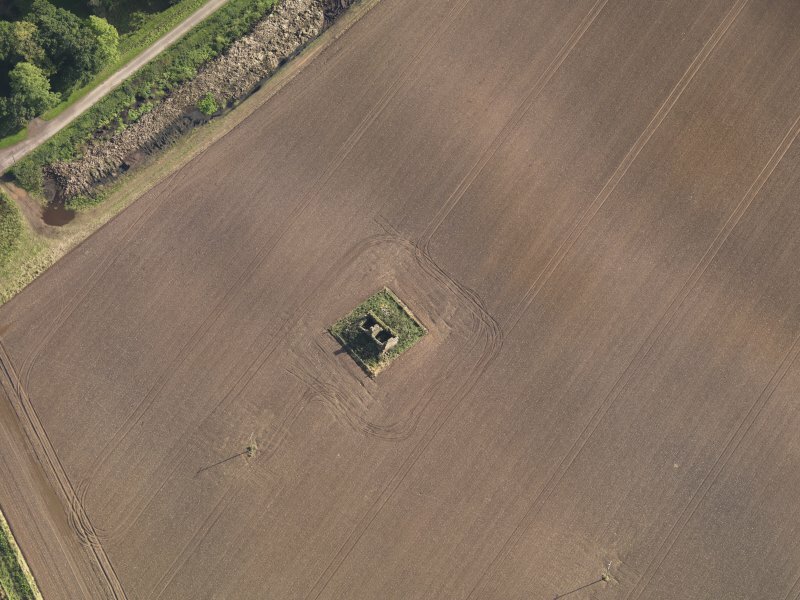 He has no knowledge of the "detached circular tower". 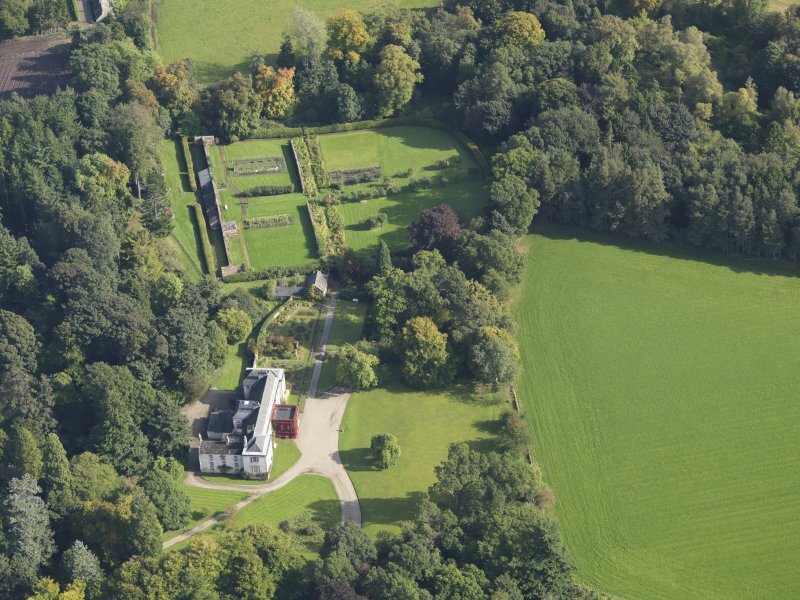 A plan of 1812 shows the west wing as it is today; but the remainder of the mansion was different - this was rebuilt by Mr Carnegy's grandfather c 1825. The date stone "1584", in the north wall of the mansion appears too well executed to be ancient, or has been re-modelled. 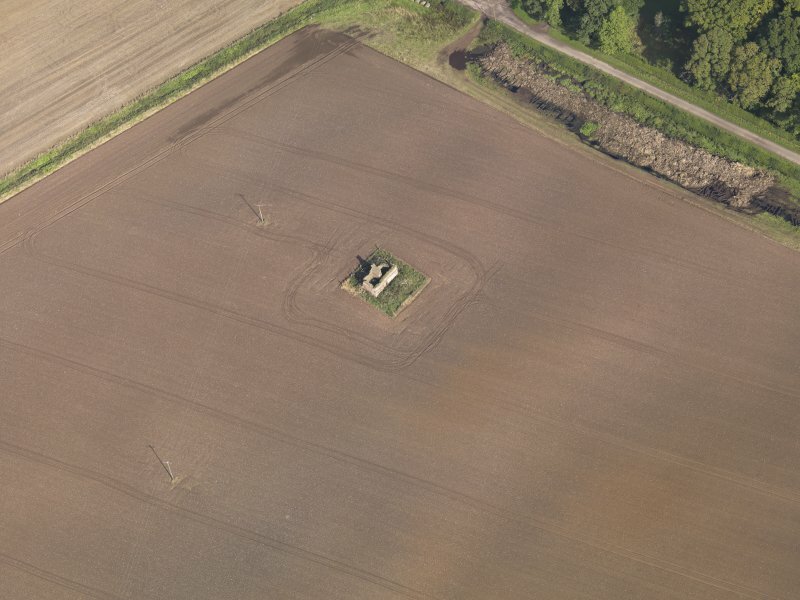 Visited by OS (JLD) 11 July 1958.